The movie's coming out on July 6, 2018. 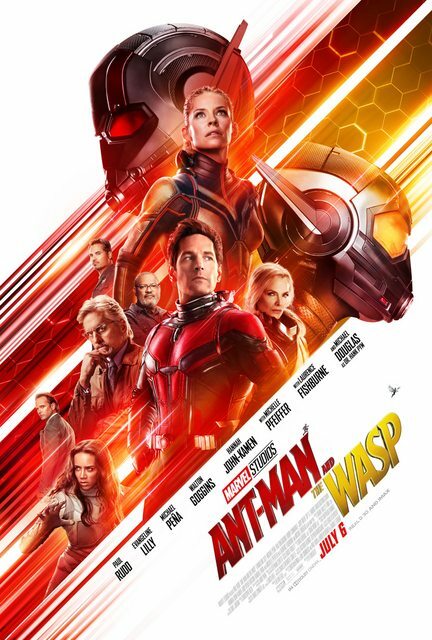 I liked the first one and this looks much better, mostly due to Wasp's inclusion. I'm really excited for this one as well because I also loved the first one and Evangeline Lilly is getting to play an actual superhero now. Also looking forward to Pfeiffer's scenes. Last edited by JeanGreyForever on Fri Jun 29, 2018 1:49 am, edited 1 time in total. Oh, how could I forget Michelle Pfeiffer? That's another big draw for me. The movie has earned mostly positive reviews (currently at 90% at Rotten Tomatoes) and pretty much everyone said it's an improvement over the first one. I'm also looking forward to this movie. The first wasn't a great film, but was a lot of fun. And this one looks like it will be even funnier and full of cool action scenes. These are pretty much my thoughts. The first film was just an alright way to spend an hour and a half. While I'm sure the sequel will be better than the first, I'm not expecting it to be something spectacular either, but it has quite a few actors involved I enjoy which makes it worth looking forward to. The film was really entertaining and at least as good as the first. And I was surprised at how the good the de-aging effects were in the flashback with Michael Douglas and Michelle Pfeiffer’s characters. Unlike certain other superhero movies these days, this was a feel-good movie. As far as I know, nobody was even killed in it, with the exception of some in Ghost's flashbacks, and I'm not sure what happened to the corrupt FBI-agent. ^ Except for the Wasp and her parents, but we all know their deaths won't be permanent. I assume that's in the end credits scene. I haven't seen it yet, and never sees it at the theatres. My patient is not big enough to sit through endless credits. They usually put it out in youtube later, if you can find it between the endless "end credits explained" videos. Yes, that happened in an end credits scene. The first of the two the movie has. The second one wasn’t important at all. I’m sorry I’ve spoiled it for you. I assumed you had seen it. I usually sit through the credits if I know the film has an end-credits scene (by the way, this website I recently discovered is quite useful for knowing that). I agree, though, that sometimes the credits seem to be endless. But my problem, at least some years ago when I saw a Pixar film, for example, was that I was usually the only one staying there during the credits and the theater workers were impatient peeking out from behind the door waiting for me to leave so they could enter and clean the theater before the next showing. So, sometimes I didn’t stay because I felt uncomfortable there. Nowadays though, thanks mainly to superhero films, people are more used to end-credit scenes and there are more people who also stay until the credits have finished. Theater employees have also gotten used to that and they don’t disturb until the movie is completely finished. I watched the movie a few days ago and it was a blast! Really glad that Cassie got an extended role in this film and I hope when the actress gets older they bring her back for Young Avengers. It was refreshing for the villain to not die and actually be redeemed. I was a little surprised on how little Pfeiffer's role was though. From the marketing I thought that she would be brought back halfway through the film and thus would have a large part but that wasn't the case. Hope we can a third film (or any other film) that does give her a large role though. Well, I had already seen that latest Avengers movie, so it shouldn't be hard to guess that it was related to that movie somehow. End credits scenes are either way just a few seconds long (and I meant patience, not patient). Another reason for walking out as soon as the movie is over is that I really hate being stuck behind a mass of people who move extremely slowly out through the door. Was just able to see it myself right now, after wading through some endless clickbait videos. Perhaps all the characters will be given a bigger role in Ant-Man 3, if they make one. Which they probably will if this one makes enough money. Considering this is just as much a family movie as a superhero movie, more parents could bring their kids to the theatre to see it. Yes, end-credit scenes are very short and usually what happens in them is not too important for the plot. This was an exception. I told what I personally do, but I understand you and most people don't want to sit through the credits and prefer to watch them later online. It's a good option too. So far the box office results seem to be on par with the first film. I guess Disney was expecting more, but I also hope they make a third one.